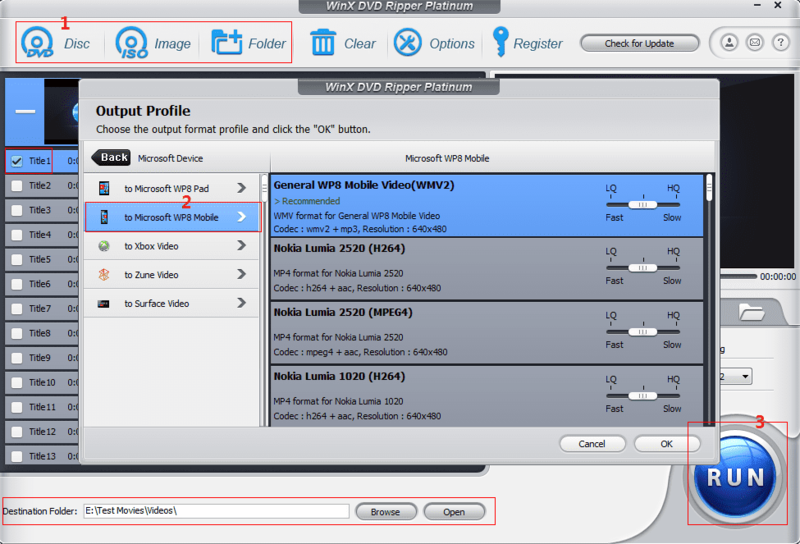 How to Rip DVD Movies to Windows Phone 8 with HandBrake 0.10? On Aug 18, 2014, HandBrake 0.10 Beta 1 was released to push out many improvements, whereafter the development team goes on working to fix bugs or issues for providing a perfect stable release version. Now HandBrake 0.10.2 official version is available to free download. The biggest change of this greatly upgraded version of HandBrake is that a new preset Windows Phone 8 is added. And here, I will show how to rip DVD to Windows Phone 8 with HandBrake 0.10. How to Rip DVD to Windows Phone 8? Rip any general and copy-protected DVDs to WP8 on Win/Mac. Alongside with new added Windows Phone 8 preset, HandBrake 0.10 updates its codec library to support H.265 encoder and VP8 encoder (only for MKV). Also, Intel QuickSync Video Encode/Decode support and Hardware Decode support via DXVA has been realized in 0.10 for Windows. 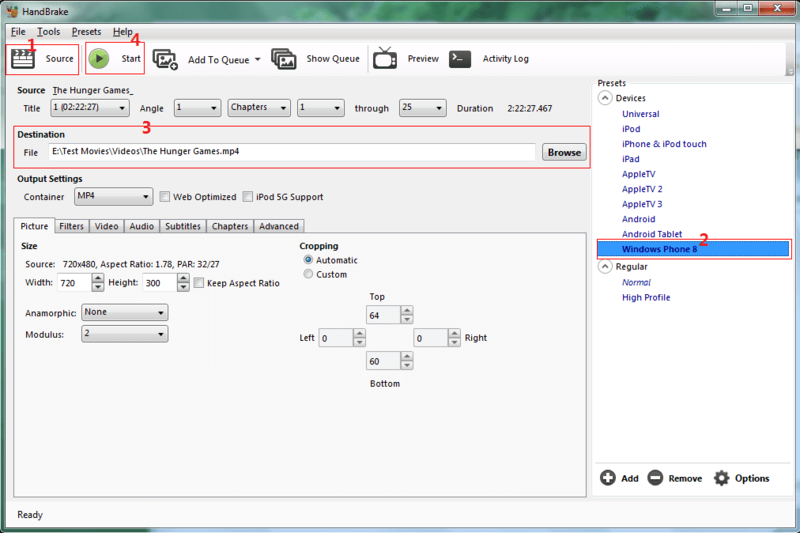 HandBrake 0.10 UI is enhanced to be more user-friendly as well, for example, improved track listbox of Audio and Subtitle tabs for Windows version. Step 1. Free download HandBrake 0.10 and open it. Hit Source button to import DVD discs or VIDEO_TS folder. HandBrake 0.10 also allows users to convert HD/SD videos to Windows Phone 8. Step 2. One title will be automatically selected after DVD is completely loaded. Keep the auto-selection or choose other title for ripping. 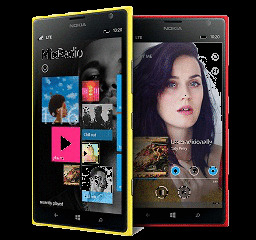 Then, click Windows Phone 8 from Devices presets module and output/picture/video/audio settings will be assigned. Step 3. Hit Browse button to set converted file name and destination. After that, click Start button to rip DVD to Windows Phone 8 with HandBrake. Moreover, HandBrake doesn't offer specific Windows Phone 8 models presets. Actually, different Windows Phone 8 devices produced by different manufacturers (Nokia, HTC, Samsung) may have particular specifications of video/audio. Therefore, output with general preset possibly results in a poor quality when watching movies on devices or even unable to play. For the sake of addressing the above errors, the best HandBrake alternative, WinX DVD Ripper Platinum is recommended to rip DVD to Windows Phone 8 faster and simper. WinX DVD Ripper Platinum is an easy-to-use DVD ripping program, enabling to rip any general and latest protected commercial DVDs, like Transformers 4, X Men: Days of Future Past, Captain America 2, Guardians of the Galaxy to specific Windows Phone 8 devices, Apple (iPhone 6/6 Plus, iPad Air 2/Mini 2 etc. ), Android (Samsung Galaxy Note 4/Edge etc.) and other OS devices. It also can clone DVD to ISO image, VIDEO_TS folder and backup main/full title to a single MPEG2 file. 1. Import DVD Disc, ISO Image or VIDEO_TS Folder to WinX DVD Ripper Platinum. 2. The accurate main title will be auto detected after all titles are loaded. Access Microsoft Devices from Device Profile and hit “to Microsoft WP8 Mobile”. Select General WP8 Mobile Video or particular device. 3. Set destination folder by hitting Browse and Start DVD to Windows Phone 8 conversion by hitting RUN button. Note: Please check DVD copyright laws in your country carefully before ripping DVD to WP8. WinX DVD Ripper Platinum - Rip and backup any DVDs (even latest protected DVDs) to Windows Phone 8 devices, iPhone 6/6 Plus, Samsung Galaxy Note 4/Edge, HTC one and other devices with no effort at all.